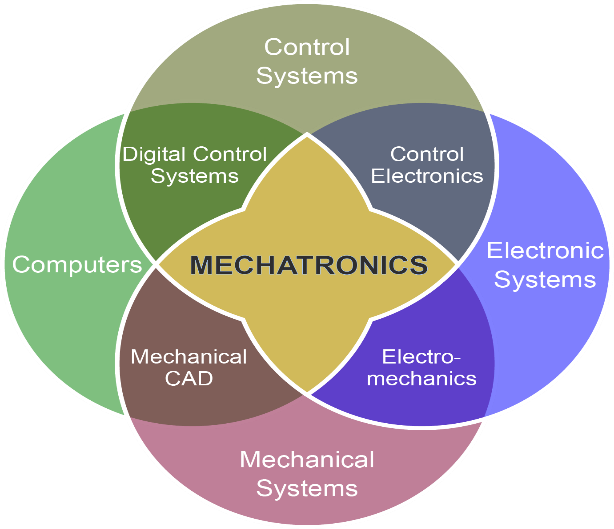 Mechatronics is the synergistic integration of mechanical components, electronic devices, computer and software engineering along with embedded control features, coming together to keep machinery operating as close to its design condition as possible. It has been described as mechanical engineering for the 21st Century. During the past 40 years, as automation started to replace staff, the technology consisted of the use of pneumatic control equipment where precision made mechanical instruments and other devices interpreted the condition of systems and transmitted pneumatic signals in a effort to control processes such as the temperature of cooling water or lubricating oil. These control systems were usually localised at the point of use although some had remote indicators such as that for boiler water level. However, on the whole, local control systems were independent of the main machinery alarm systems and the measurement of processes inside hostile environments, for example the engine combustion space, were not possible. The modern world of mechatronics has started to alter this situation and lift marine engineering onto another level of sophistication. We see already the electronic control of diesel engine combustion increasing engine flexibility and lowering emissions. Now, other marine components are also being produced with the ability to link into the central machinery management system, and as algorithms become ever more sophisticated so will the efficient use of the equipment. The focus for the development of mechatronics onboard has now turned to the topology used in communication protocols with modbus and canbus being the top runners. However, other manufacturers are producing equipment that uses profibus. It would be helpful, therefore, for our industry to have one communication specification rather than require equipment to cover different protocols or for manufacturers to have to change standards half way through their production run, which is a possibility at present. Mechatronics also has the potential to provide the industry with an increased quantity of information relating to the condition of machinery thereby giving owners the evidence they require to ensure their vessels are complying with legislation. In addition, such information will enable managers to increase efficiency thus decreasing fuel consumption and maximising profits. The capability of mechatronics to assist the industry with its move toward higher efficiencies, lower energy consumption and more eco-friendly vessels is on the horizon. Given the right development, more sophisticated and so called intelligent systems will be capable of linking the control of machinery with the production of machinery condition data. This will drive efficient management systems enabling ship and head office staff to work together by improving not only the vessel’s voyage planning but also the efficient use of machinery. This will increasingly mean different types of fuel and/or propulsion types and will also include more efficient maintenance systems and changes in the general management of vessels. The integration of embedded systems into the control of marine machinery will once again bring to the fore the importance of crew competence and focused staff development. We now have in place the “manila amendments” to the STCW convention. Specific outcomes from this update require a focus on the operation of pollution prevention equipment and, more generally, additional emphasis being given to environment management. There will inevitably be a concentration on diagnostic techniques for ship staff since they will be in the front line in the event of any emergency, for example, the alarm monitoring system indicating that the ship is not producing the correct exhaust emissions as the vessel is approaching a SECA area. This issue would clearly have to be resolved urgently so the vessel does not risk incurring a hefty fine. With sophisticated control systems in place, crew familiarisation will be essential therefore continuity of staff, efficient handovers and the use of integrated management information systems will be required in running the modern fleet effectively. We considered the area of control engineering and the different transmission protocols but we did not consider the future of these systems. This has to be an area of change that has to potential to cause substantial upheaval to the industry. As the systems become more sophisticated and the level of information available increases, making sense of and analysing the data correctly will be an ever increasingly complex task. This will not always be done correctly and that will lead to problems such as machinery malfunction or failure. To see the future within the marine industry you only have to study the work being completed in other industries. Data Collection – Working data sets need to fit what we are trying to predict. Data Quality – Lots of data already available and far too much noise. We need less noise. Data Volume – Too less of the right data and too much of the wrong data. Model Usability – Have the right disciplines to develop the models and not just a data-scientist but Subject Matter Experts. The SME can cut down on cycles of iteration and get a predictive model that works within a level of tolerable risk. We believe there are processes and systems out there that can significantly deal with these challenges in various ways but like anything it needs time and money to develop. The key question is do we get busy helping crews or reducing crews on board ship to improve safety and reliability? We know of some well known Offshore Operators whom have tasked global Equipment Manufacturers to eliminate crews through automation. It is a sensitive subject and has merits on both sides of the debate. For now, we place our money on helping crews, but we need to build a culture of reliability and provide proper reliability management and analysis tools to the industry instead of conferring this responsibility always to OEMs because they have their own commercial agendas and will maximise their revenue to the Shipowner; it makes perfect commercial sense to the OEM but not the Shipowner as someone has to pay for the Condition Monitoring, Condition-Based Maintenance and the analyses of data too; this will be an expensive proposition to the Shipowner irrespective of perceived watertight Service Level Agreements because failures can occur at boundary level that is not that OEMs responsibility. To overcome this problem we recommend independent verification of CM and CBM packages through Reliability-centred Maintenance processes. Too early to say, but are we looking at a design issue with Viking Sky? Could this have been captured early on in the DFR process? Could the second layer of running Reliability Analysis on critical systems have picked this up? Many questions will remain open for some time yet.